It was more than two years ago that my relationship with the team at H&R began. Ever since, it has grown more and more clear that beyond producing world class suspension components, H&R is a brand owned, operated, and driven by automotive enthusiasts. Their passion for cars and the driving experience is usurped only by their drive to produce springs and shocks of the highest caliber and quality, not only in their homeland of Germany, but in the world. 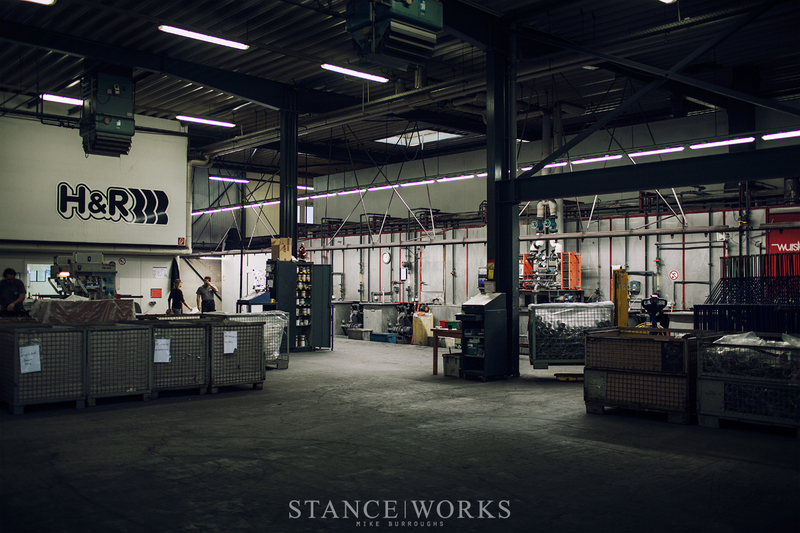 During our trip to the Essen Motor Show, we were given the chance to tour H&R's manufacturing facility in Lennestadt, Germany, to see how the company produces the very springs that have ruled the racetrack and the street since the 1970s. 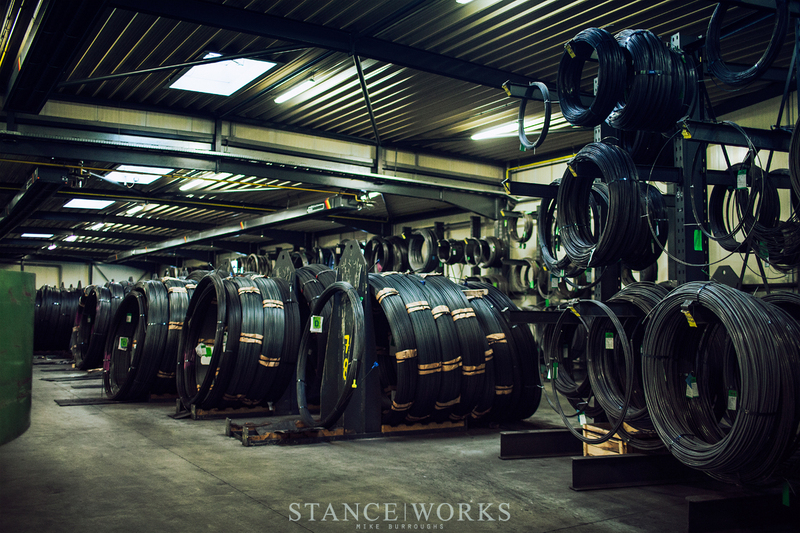 Tucked away amongst the hills in the small town of Lennestadt, Germany, lies H&R's headquarters: a manufacturing facility that spans 850,000 square feet, housing an entire production line capable of producing every component of a sport suspension system. 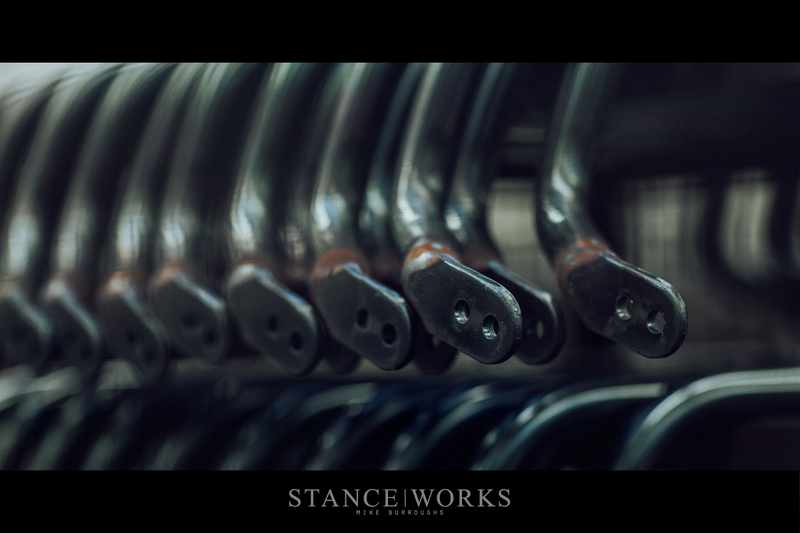 However, more impressive than H&R's scale was their process, and the steps involved in creating a product known for its fit, finish, reliability, and most importantly, its function. Through their craft, they've given clout and fortitude to the iconic term: "German Engineering." 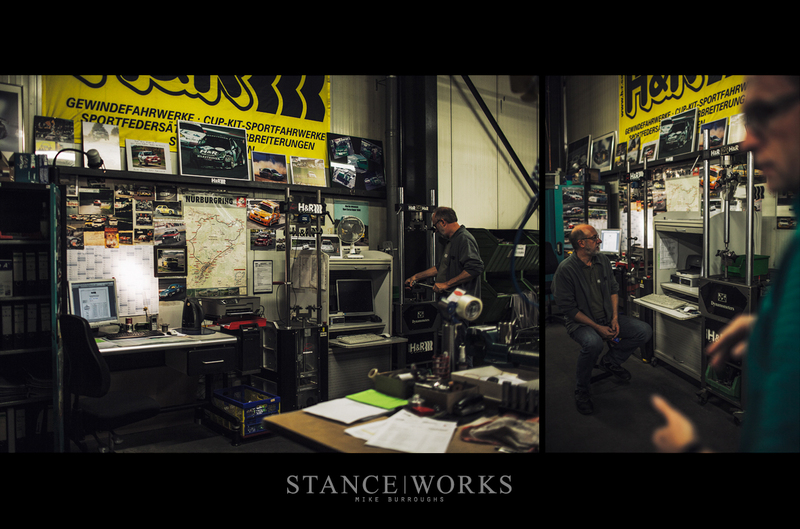 Eager to learn more about each step in the undertaking of suspension production, we asked for the in-depth tour, and H&R was happy to oblige. H&R's product line is massive. With the official name of "H&R Spezialfedern" which translates to "H&R Special Springs," it should come as no surprise that the brunt of their production is in the spring industry. However, while their roots in the automotive world have remained, H&R has grown to produce springs for both industrial uses and for the medical world. Their offerings also include automotive parts such as sway bars, wheel spacers, wheel studs, electronic lowering modules, and more. Each part shares one thing in common: they all begin life at the hands of an engineer. 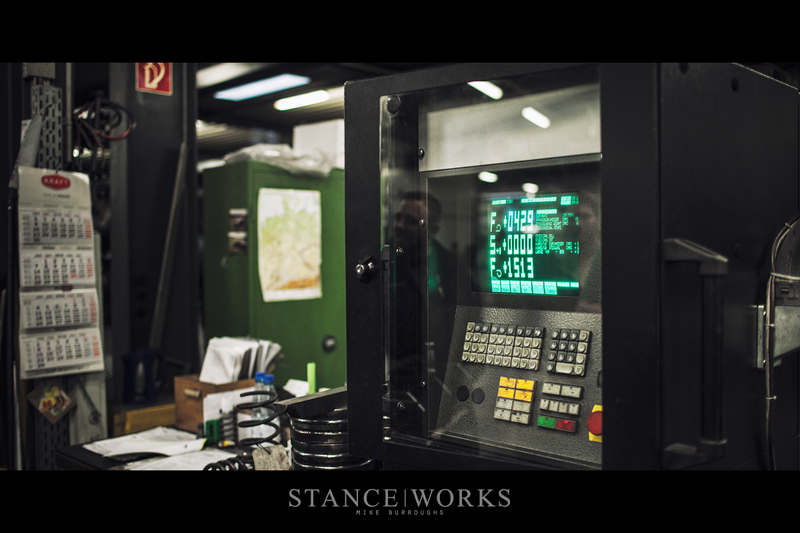 Each H&R part is designed and tested in the digital world, as seen above, before it heads to production. 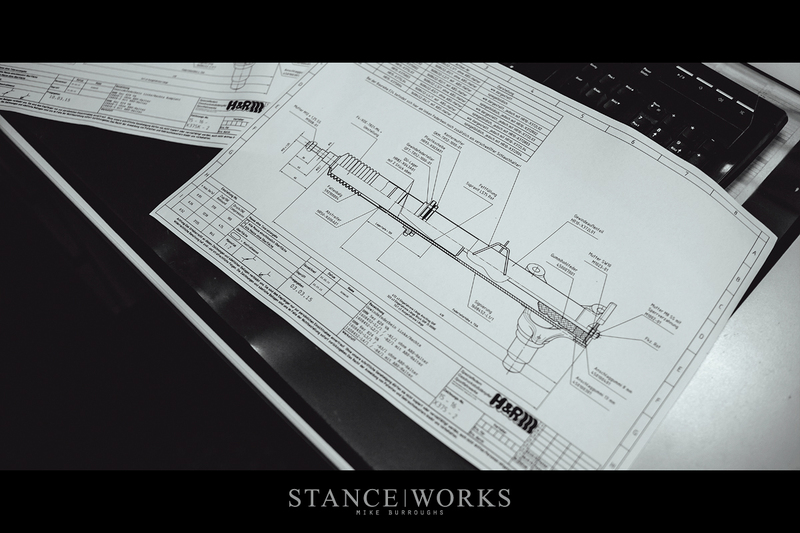 After the design and prototype process is complete, the details and necessary data are sent downstairs to the factory. 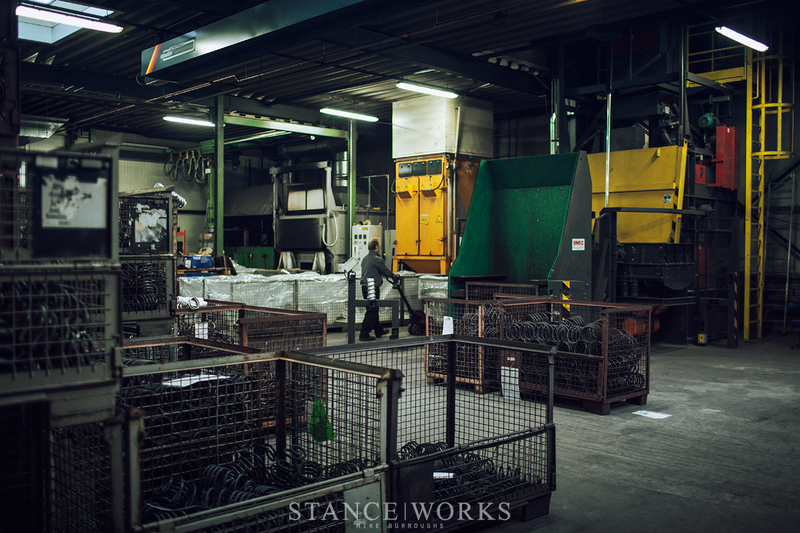 First and foremost to the nature of the company is spring production, and each spring begins life as a segment of spooled "wire." Each spool represents a different wire size, often in .25mm diameter increments, ranging in size from fractions of a millimeter up to as large as 50mm, or two inches, for super-strength industrial level springs capable of supporting tens of thousands of pounds of force. Dependent on the application, a given wire size is loaded into a computer-controlled spring-making machine. 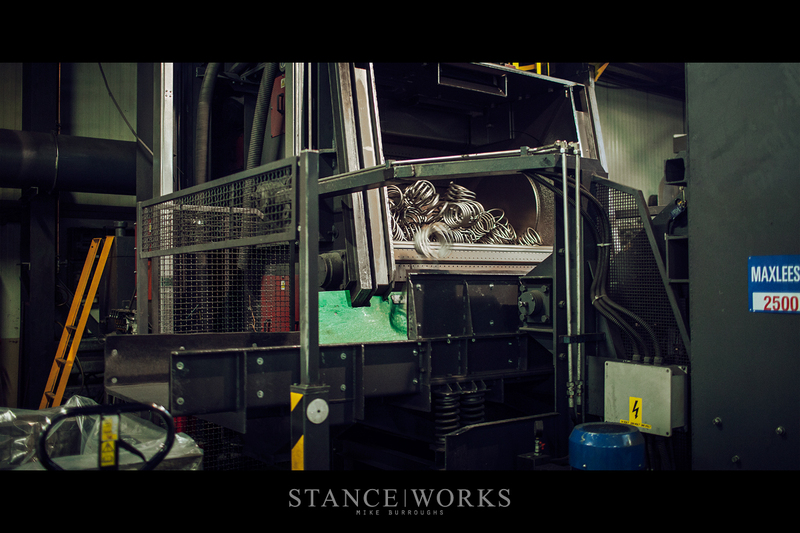 The wire is fed through a series of dies and rollers before it enters the jaws of the machine, which work in unison to transform straight spring steel into dynamically spiraled springs. Typically, three "jaws" shape the spring: two wheels control the diameter and coil of the spring, while a third wedge controls the spring's pitch, or the distance between each rung of the spring. 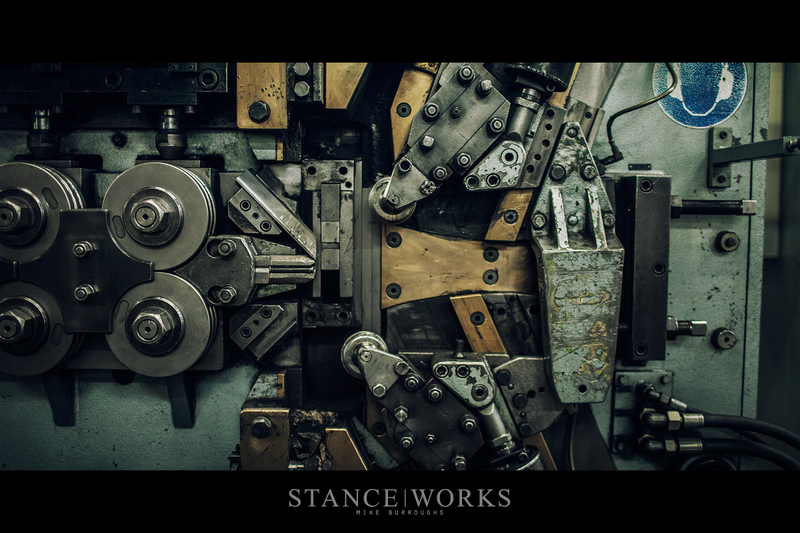 Every few seconds, the machine ejects a new spring, which can range wildly in design, depending on its use. 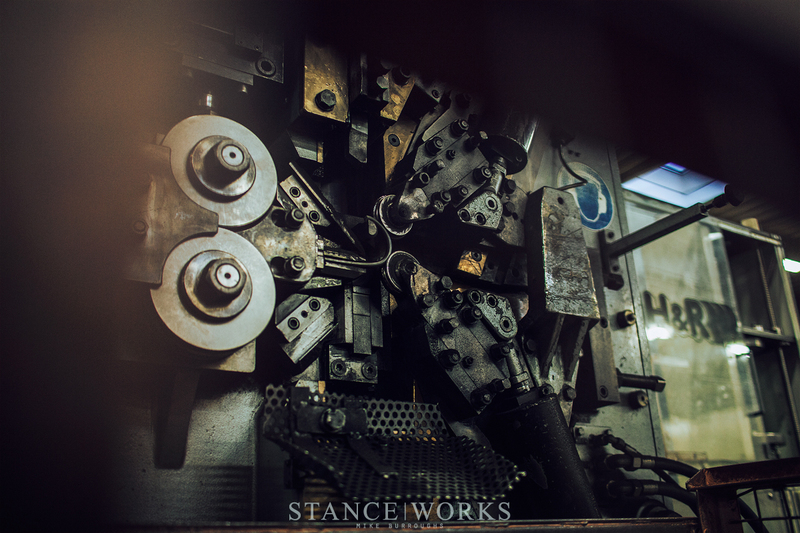 As we watched, one machine produced progressive-rate springs, while another produced a linear counterpart. 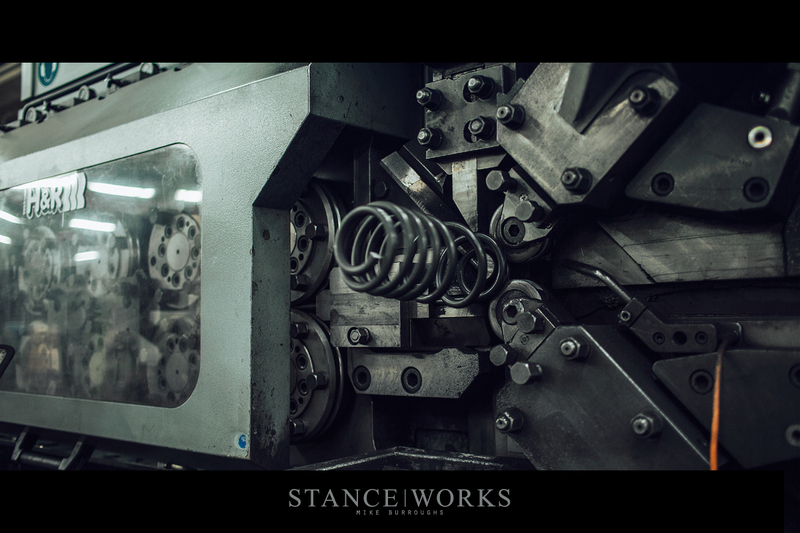 Each spring machine in the factory possesses different capabilities, allowing for an endless number of spring designs and compositions. 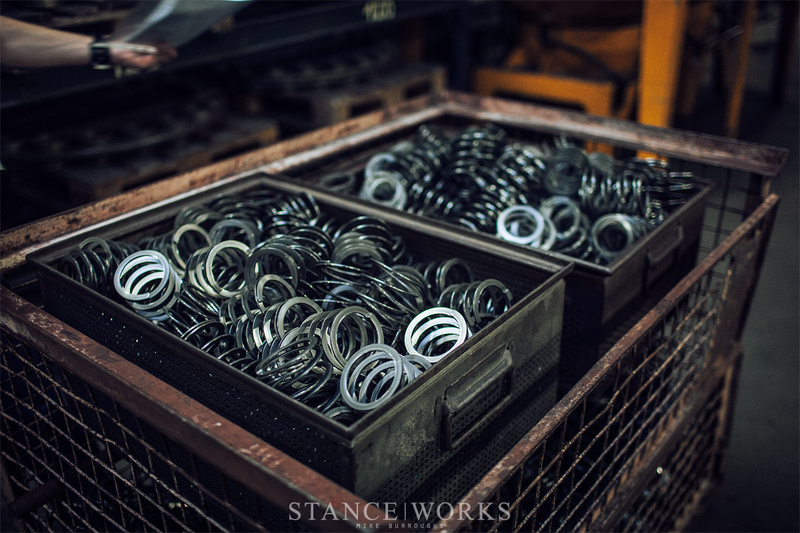 As the springs are finished, they're piled into a bin in preparation for the next step of the process. 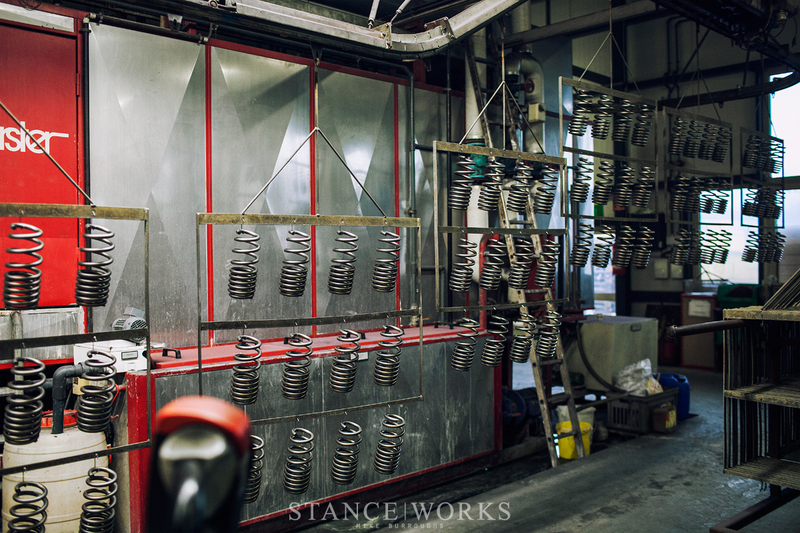 The basic springs are moved through the factory to the next wing, where they're placed in a menacing machine meant to grind the top and bottom of each spring to a flat surface. 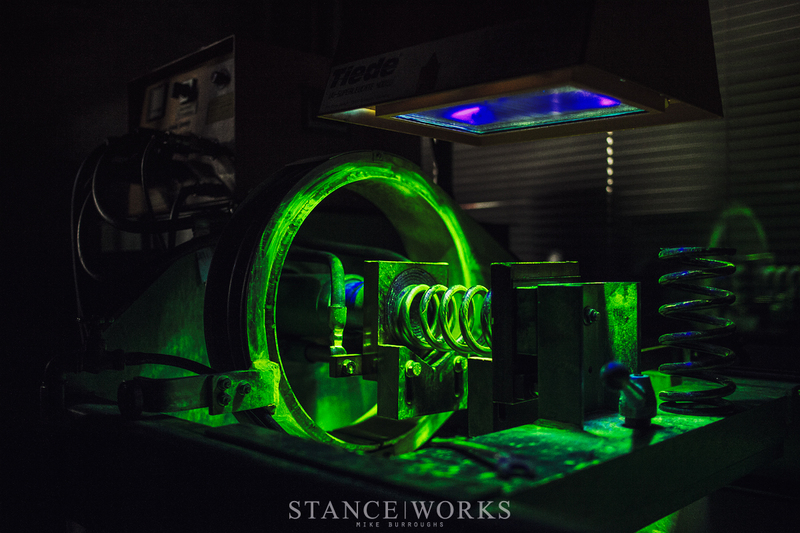 Sparks fly as the springs rotate past the grinding heads, pass after pass, until their surfaces are flat and smooth, allowing them to seat properly against coil-over collars, spring pads, and more. 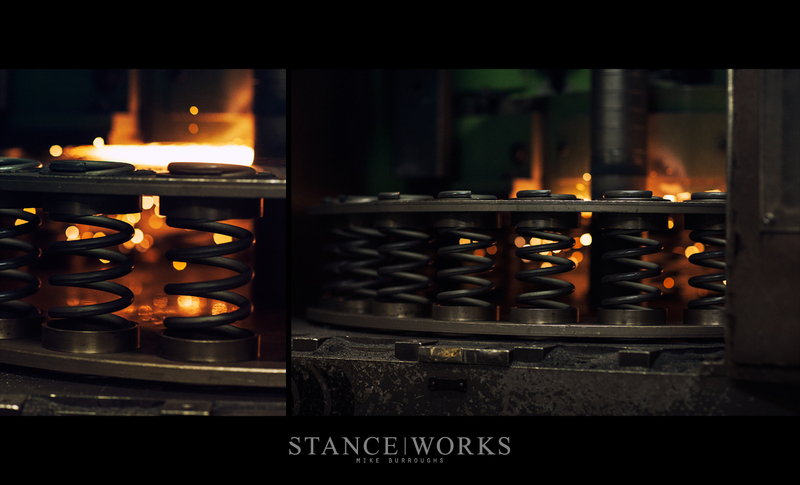 The next step in production is to heat the springs, effectively "setting" their metallurgy, or metallic composition. This finalizes the spring rate and "structure," before they head to finishing. 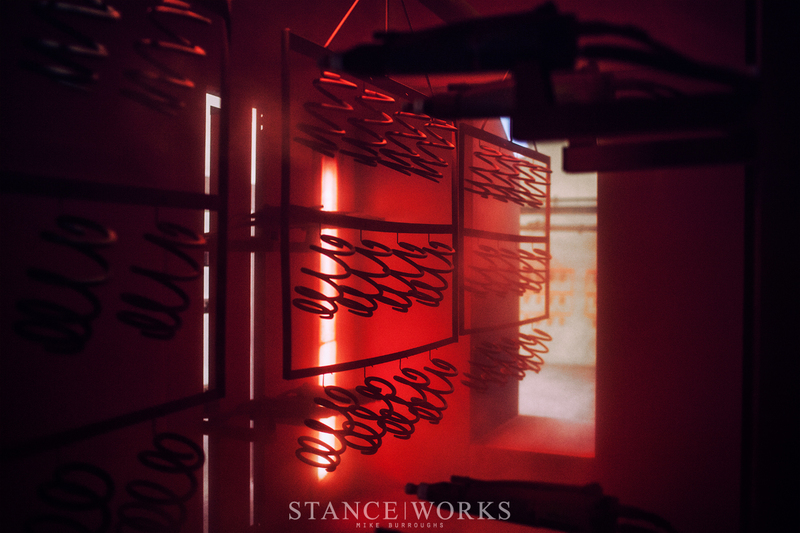 Each spring is placed inside of the enormous machine below and shot-peened, which smooths the metal, removes any imperfections, and prepares the springs for powdercoat finishing. The resulting finish and smooth and mar-free, possibly looking painted to the untrained eye. However, from this stage, there's still a long way to go. Much of H&R's reputation hinges upon their dedication to quality, and the idea that how a spring lasts is as important as how it performs. 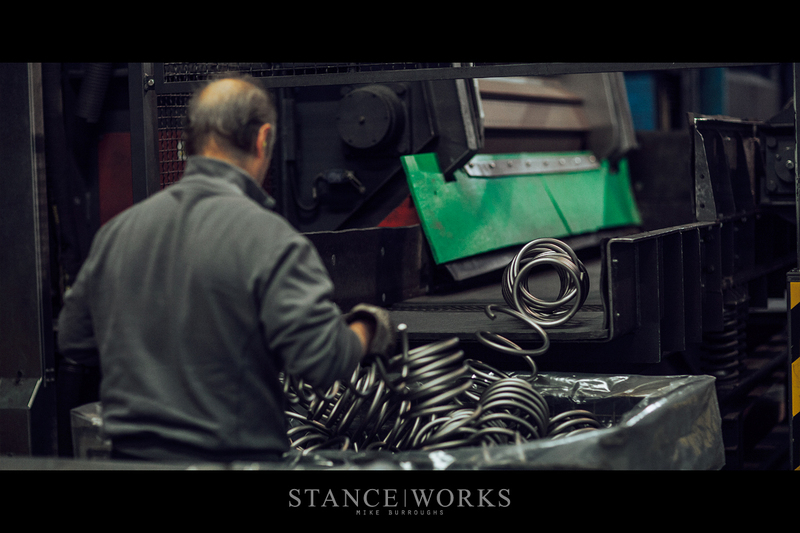 While the springs are undoubtedly fit for duty as they are, H&R puts them through the grueling paces of quality control to ensure the quality their name represents is upheld. 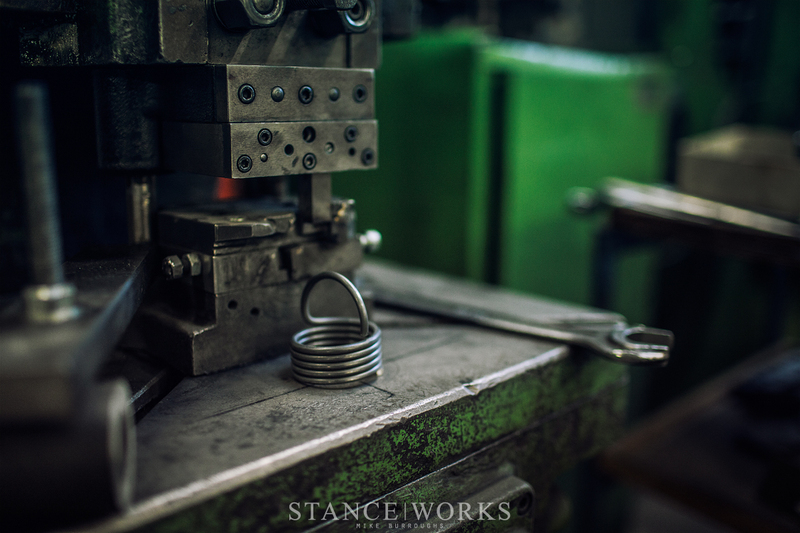 As batches of springs pass through the stages of production, springs are pulled for structural testing, which takes form in many ways. The first, more visually enticing procedure is an analysis for cracking. 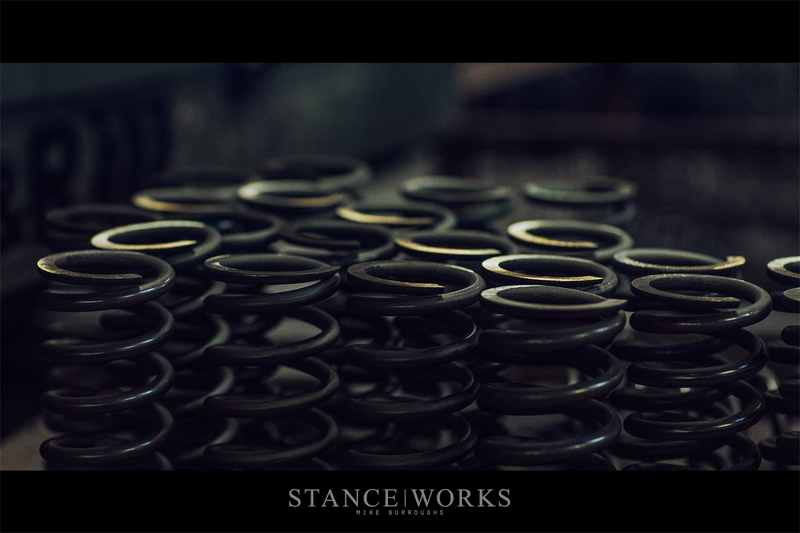 To begin, springs are heated through induction, and coated with a special paint that helps to highlight structural cracks within a spring. The cracks are highlighted in bright neon yellow, which can even highlight cracks within the spring. This process helps to ensure that the springs will not break under even the most extreme usage, and also helps to assure that the production steps are calibrated correctly. In order to demonstrate the process, a spring was super-heated and rapidly cooled, allowing us to see what a failure looks like. Another step in quality control is durability testing. Deep underground, buried within a sound proof room, is a machine built to push springs to their limits. Springs from each production run are loaded inside, and a rotating cam in the center compresses and decompresses each spring, cycling them more than a half-million times before they meet approval from H&R's engineers. 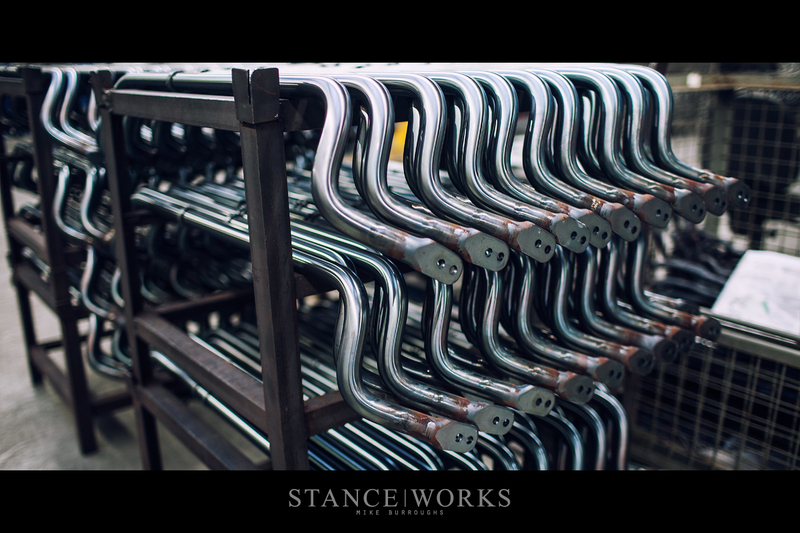 Sway bars are manufactured next door in the newly-constructed addition to the factory. 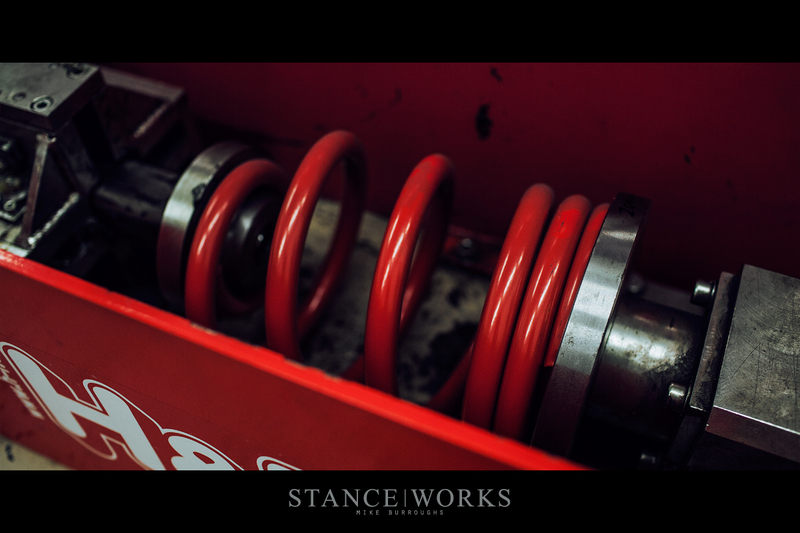 While a sway bar represents an entirely different part of the suspension, at it's core, it's very similar, as it is still a spring. 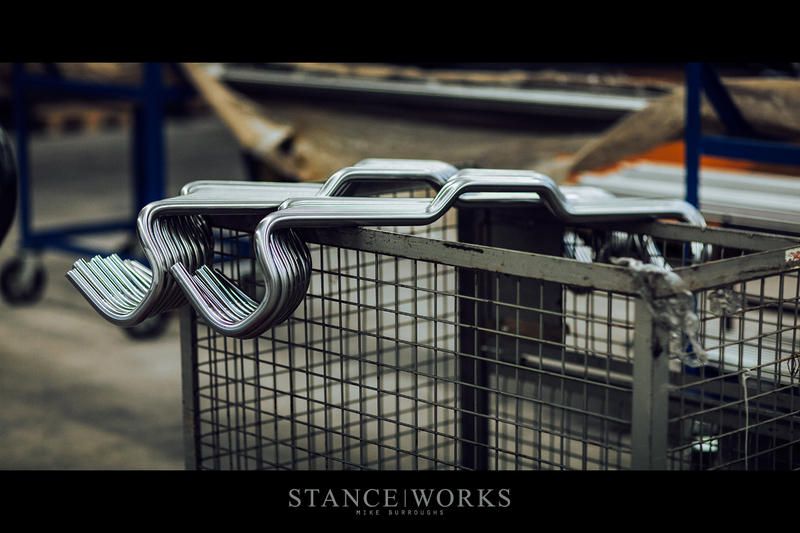 Sway bars begin as straight metal stock, or long straight bars of steel. 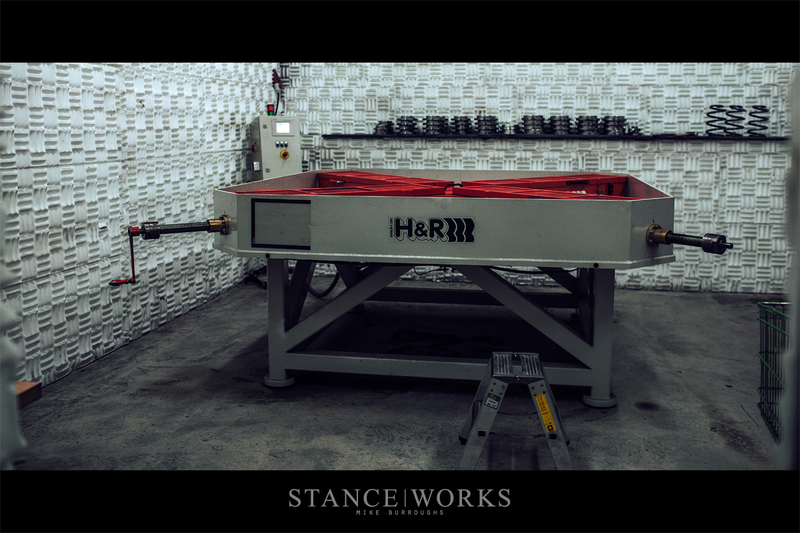 H&R's proprietary machines are built to produce precision sway bars of any shape, size, or configuration for nearly any platform. The machine is computer controlled, and begins by clamping the bar stock at one end, feeding it and rotating it as needed, while the opposite end bends the metal around any one of three dies, creating the necessary bends with different radii. The operator stands clear as the sway bar grows in length. It protrudes from the machine, swinging every which way as it takes shape in under a minute. 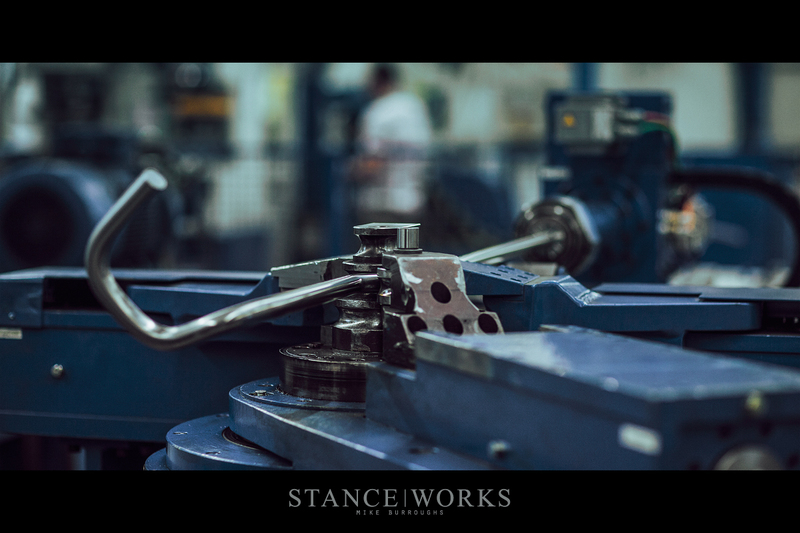 Each bend in the sway bar is precise and calculated, and after shaping, each one is tested for trueness. While the shape itself is familiar as a sway bar, there's still more to do. The ends at this stage are just round bar, and in order to connect the sway bar end links, the ends must be shaped appropriately. 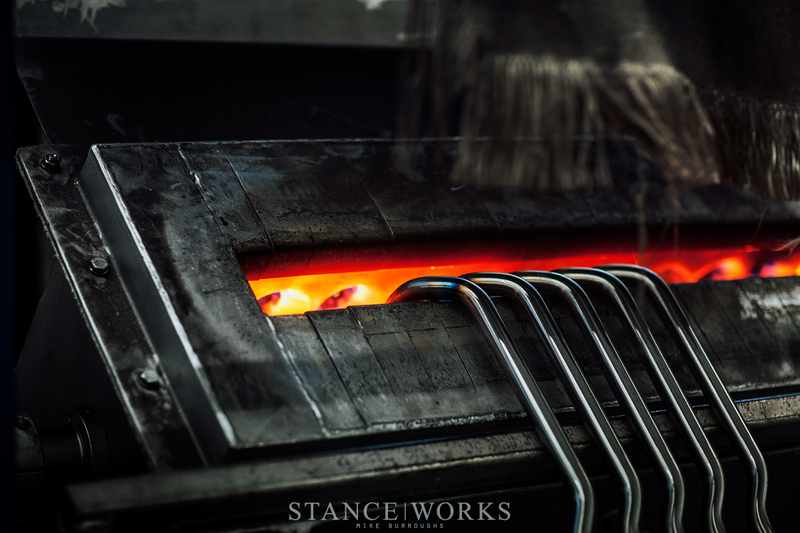 Each sway bar is heated to a red-hot glow, allowing successive machines to shape the end, and then punch the necessary holes through it. 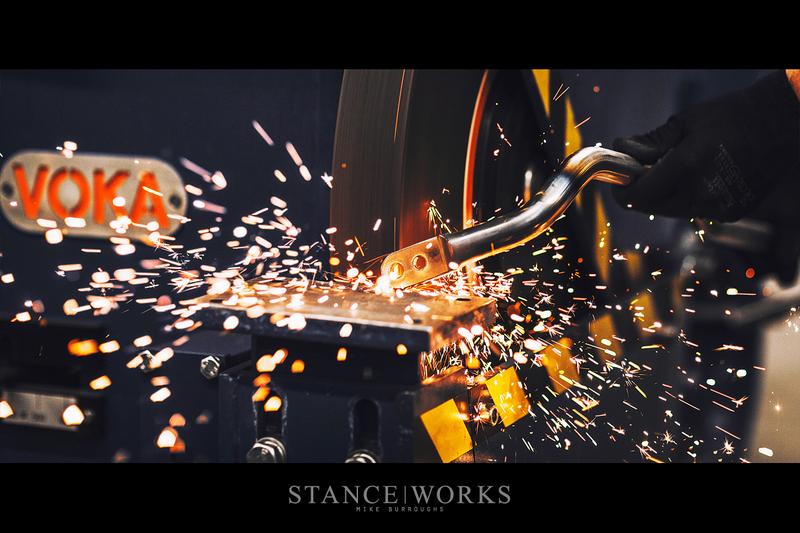 The final step is to smooth any imperfections from the end forming process, which showers the work area with a picturesque explosion of sparks. 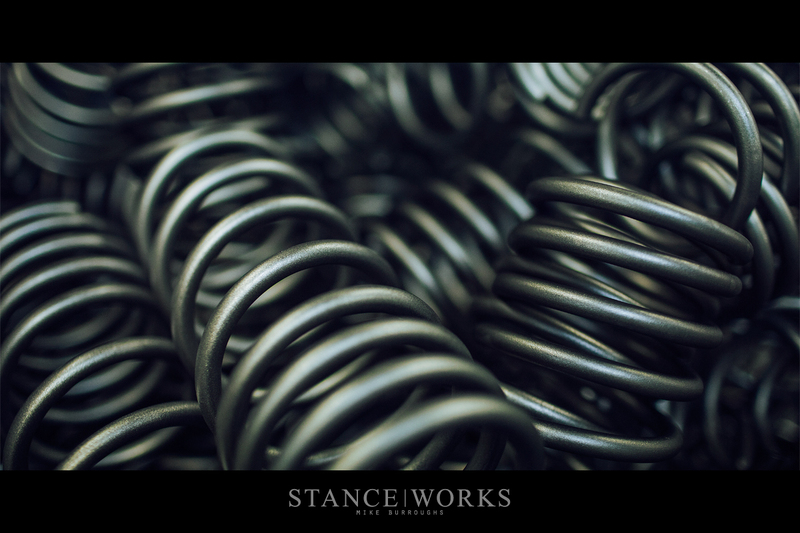 Both springs and sway bars wind up in the same place for powder coating. 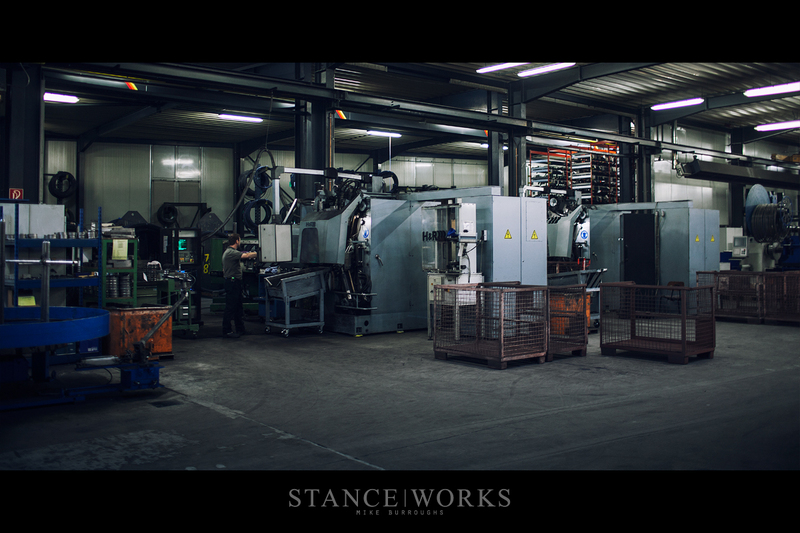 Occupying its own building, the powder coating facility is both massive and impressive, housing an automated system which ensures a perfect finish on every H&R part. Shot-peened parts go in, and beautiful red and blue springs emerge from the oven. 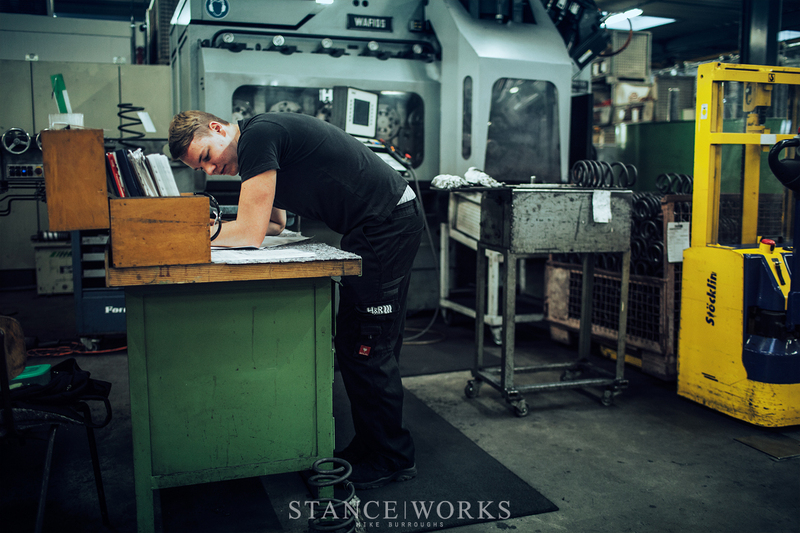 Finishes are durability tested in a heated salt-pray machine for hundreds of hours as part of the control process. 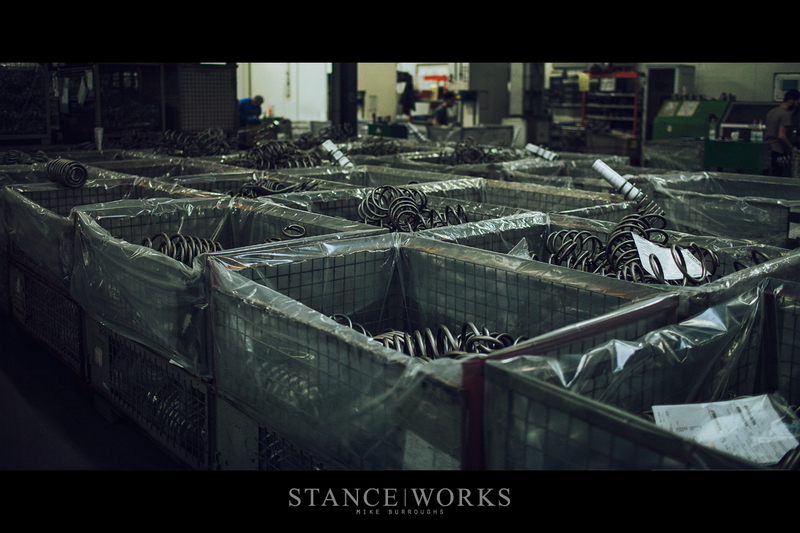 Finished springs are housed in the warehouse, which is intimidating in size. Row after row, and aisle after aisle sprawl across the concrete, housing more than a half-million springs at any given time. H&R prides itself on delivering products quickly and concisely, holding the belief that it is vital to supply its customers without wait. 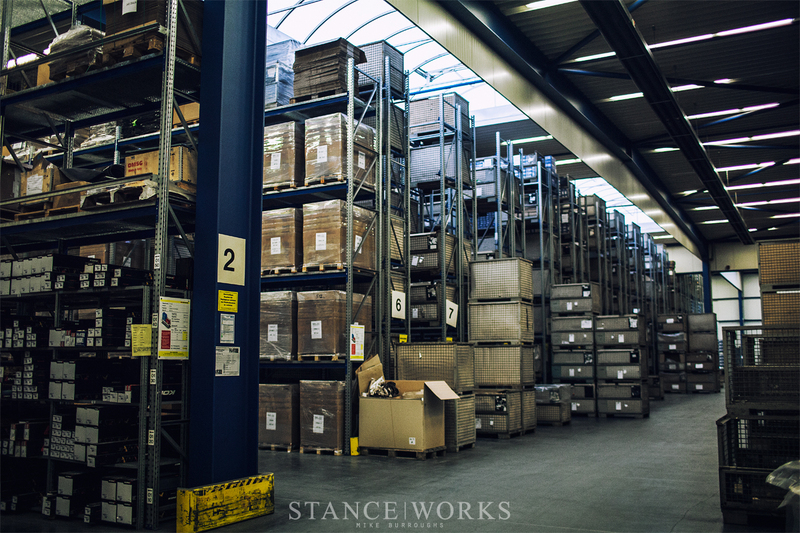 Underground, an equally surprising number of spacers are housed, as far as the eye can see. 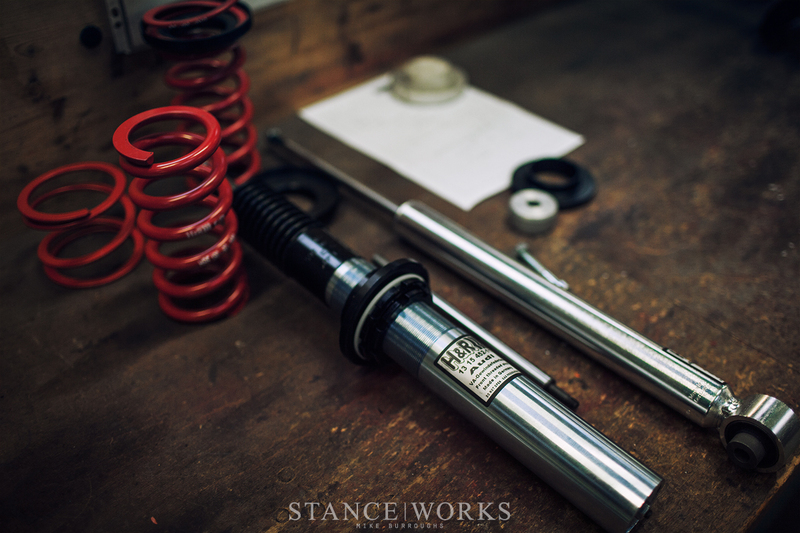 With springs and sway bars complete, there's one piece remaining to the puzzle: shocks. Integral to H&R's spring and sway bar sales is sales of performance shocks and of course, coil overs. 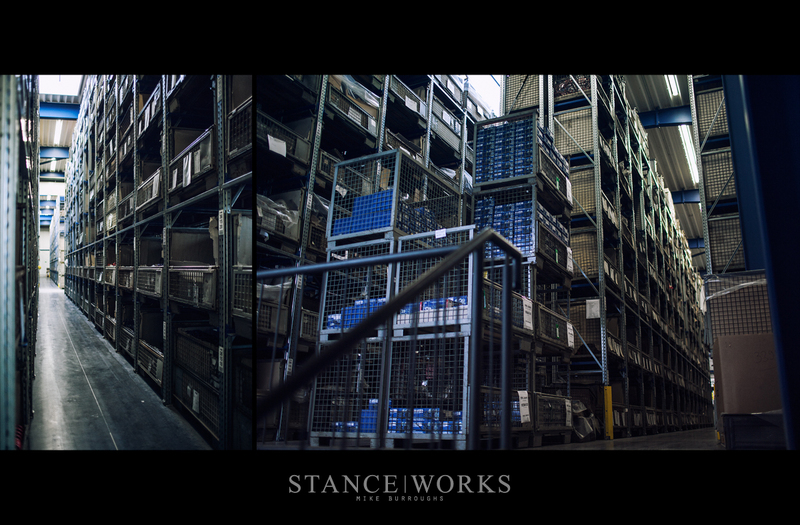 In offering coil overs for seemingly every platform, another warehouse contains aisles of strut housings and mounts. Some parts, such as these E36 coil over housings, are built application-specific by H&R, while others, such as classic E28 coil overs, are built from original BMW cores. 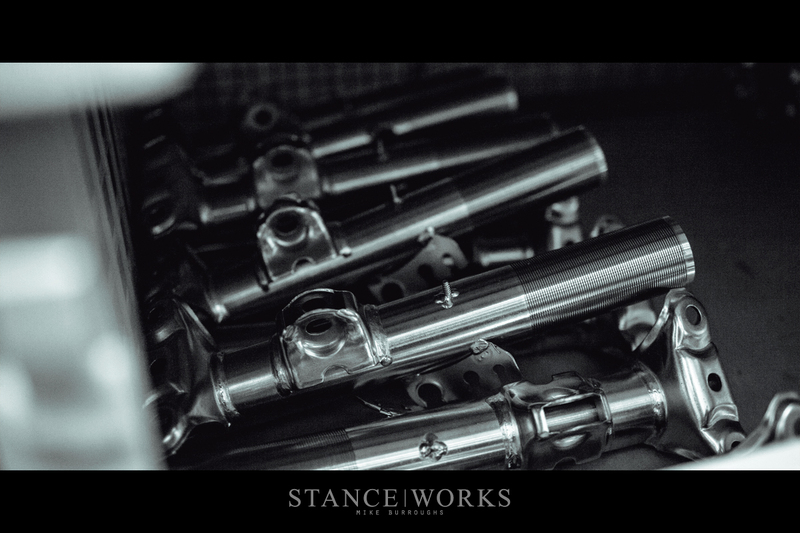 Lastly, there's H&R's race-specific parts, such as the aluminum monotube bodies used for Rusty Slammington's suspension. Each part may be different in form, but they function all the same. 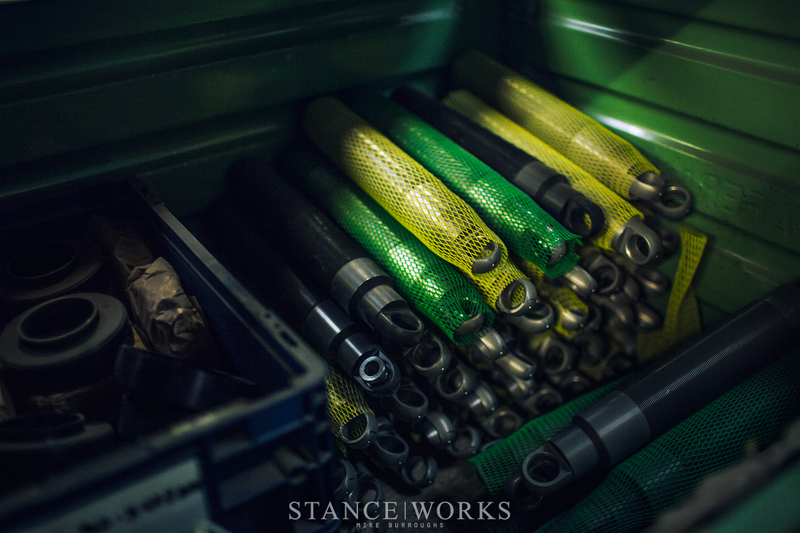 Each monotube shock is hand assembled at H&R, one at a time. Each application receives custom valving and specifications, making certain that any car fitted with H&R's coil overs performs at its best in both function and comfort. We watched as several struts were filled with gas, and then fluid, one part after the other. 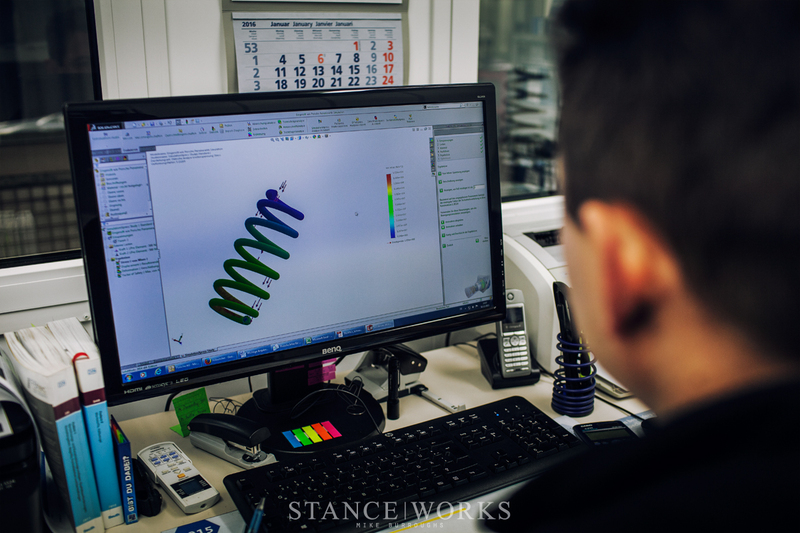 Following construction, shocks from each application are dyno tested for performance and longevity, aiming to guarantee a world-class shock to pair with a world-class spring. 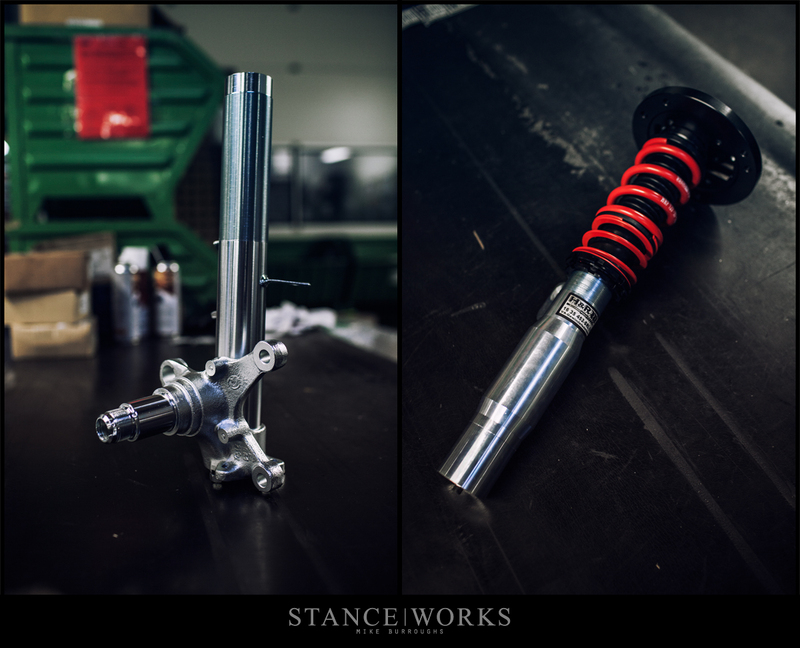 With the shocks complete, all that's left is assembly and packaging - H&R's suspension is complete and ready to be bolted on and ready to run, straight out of the box. 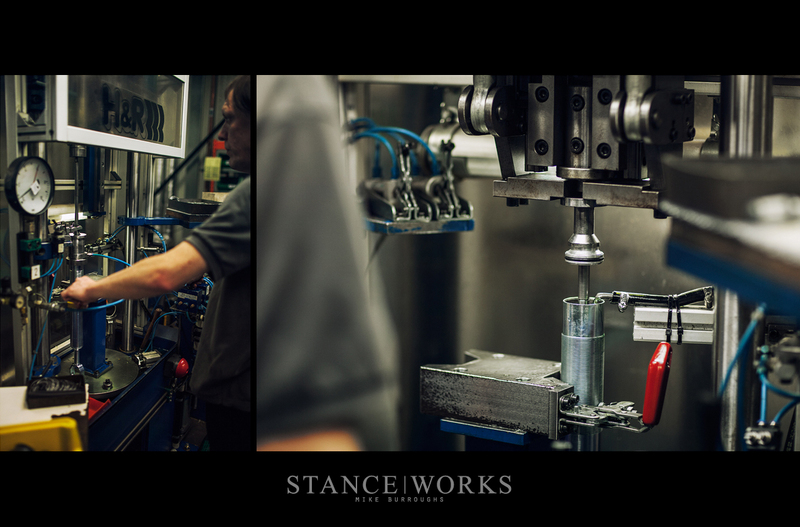 From concept to reality, H&R's suspension components follow a philosophy which insists upon the highest grade of materials, the finest degree of engineering, and perhaps most importantly, an integrated sense of automotive enthusiasm. Few companies are run by those that believe in their product and their customers over a dollar, but it's this mentality that has established H&R as the industry leader in high performance, high quality suspensions, sacrificing nothing in the name of a perfect product for a dedicated customer. Mike, I have to say, your photography is excellent! As are the words that accompany them. Really hope the strut housing on the picture is mine :) they are getting built now.